You will be considering a career in any area of public sectors, management, or planning to develop your own business. Not only will you gain administrative knowledge, you will also develop the skills to apply your knowledge to the analysis and solution of public problems. This module will introduce students to basic mathematical topics useful in their different courses of study. To introduce students to basic mathematical topics useful in their different courses of study at Baze University. Apart from learning the basic statistical tools useful for data collection, they will also gain valuable insight into number system, the concept of sets, laws of indices, solving equations and a wide range of other basic mathematical techniques. In essence, this module is designed to equip students with useful methods of solving and approaching mathematical problems. Introduction to Number System, Laws of Indices, General Inequality, Equation Systems, Algebra, Sequences and Series, Trigonometry as well as general overview of Statistics. Lectures: Lectures will be used to introduce and explain major ideas and theories and to illustrate their wide-ranging applications. Interactive lectures will review materials by encouraging their active participation - inviting questions, working through examples, giving short quizzes, discussing case studies, or showing a video followed by a quiz, etc. 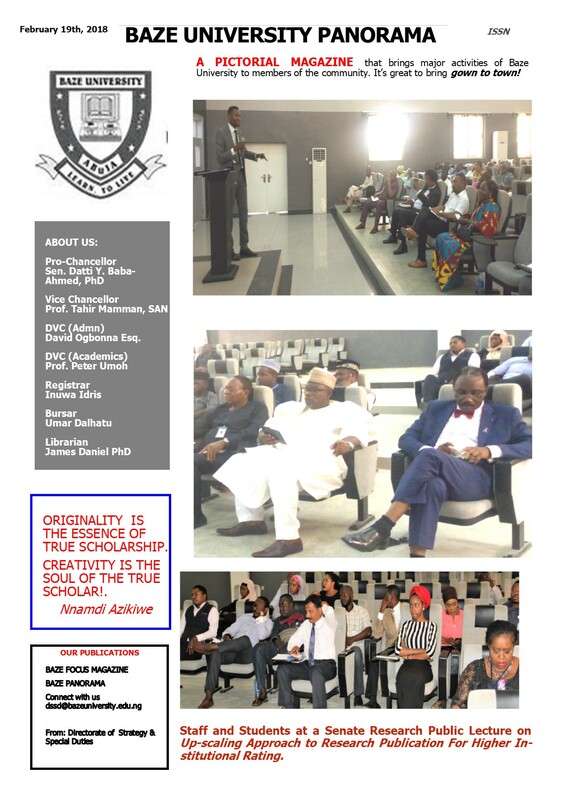 Classes: This will encourage students to begin to apply the knowledge gained to real and hypothetical cases and will encourage them also to gain confidence in presenting and defending their own ideas. Classes will usually require them to read some material(s) for discussion, or prepare answers, give some presentations, research a topic, take part in a debate, etc. Homework: Homework will be assigned regularly. Regular assignments will help them understand the material and they will get feedback. Ability to read and understand fundamental mathematics. Ability to apply range of concepts in Mathematics or represent and solve problems in Mathematics. Ability to represent and analyse data using the right techniques. Basic College Mathematics by Elayn Matin-Gay, New Jersey, Pearson Prentice Hall. College Mathematics for Business, Economics, Life Sciences & Social Sciences (11th Edition) by Raymond A. Bernet, Michael R, Ziegler, & Karl E. Byleen. New Jersey, Pearson Prence Hall. Algebra & Trigonometry (Sixth Edition) by Michael Sullivan. Prentice Hall, Upper Saddle River, New Jersey 07458. Any other mathematical textbook that covers any of the topics. Academic Skills course is designed to give students the tools and skills that they need to get the most out of their undergraduate study at Baze. Thus, it is angled towards a range of areas and ideas. One such area is to improve your standard of English. Beyond that, it is also to prepare you to excel in professional and business settings. The aim of this module is to give the student the ability to acquire and use basic English Language skills and other personal and interpersonal skills which are required in academic, professional and business domains. Study skills and methods. Use of Library. Research skills. Reading skills. Units of Grammar---Morpheme I. Parts of Speech I. Parts of Speech II. Phrases and Clauses: types and functions. Sentences: types, structure, and functions. Tense and Mood. Concord and Meaning relations. Lectures will serve to explain the topics in the syllabus. Class activity, interaction and discussion will serve to arouse individual participation, grow communication skills and self-expression. in academic, professional and business settings. Demonstrate proper understanding of referencing a work. Essential Academic Skills. (Oxford University Press, Oxford, 2011). Oxford Guide to Effective Writing &Speaking,2nd Edition,(Oxford University Press, Oxford, 2005). Understand the evolution of the business organization. Discuss and compare different models and approaches to understanding the firm in the context of the business environment. Provide a comprehensive introduction to the key elements of the business organization. Build a foundation of knowledge on the different theoretical approaches to business and decision making. Develop analytical skills to identify the links between the functional areas in business, organizations, management practices and the business environment. Types of Businesses and issues affecting business in Nigeria; Leadership, Founders and Climate; Marketing; Human Resource Management; Strategy; Organizational Planning; Supply Chain and Operations Management; and Financial Management. Lectures will be used to explain the topics in the syllabus. In some cases, appropriate video will be used to enhance students understanding. Class discussion will be used to enhance individual participation and develop communication skills. Explore the impact of key environmental factors on decision making and organizational behavior. Evaluate the significance of public policies in business and entrepreneurial activities. John T., and Courtland B. (2015), Business in Action 7th ed., Pearson Education, Essex. Sandino, T. (2007). Introducing the First Management Control Systems: Evidence from the Retail Sector. Yukl, G., (1989). Managerial Leadership: A Review of Theory and Research. Journal of Management, Vol. 15. This Course Examines The Constitutional Background Of Public Administration; Nature of Public Administration; similarities and Differences between Public Administration and Private Administration; schools or conceptual approaches to the study of Public Administrations. The aim of this module is to expose the learners to the rudiments of public administration, in areas of meaning, nature, scope, public and private administration, conceptual approaches to the study of public administration. · Group method will be used where necessary to encourage team spirit among learners. · Class discussion will be used to arouse learners interest and encourage their participation. ii. Ezeani, E.O. (2006). Fundamentals of Public Administration. Published by Snaap press Ltd, Enugu. iii. Shafritz, J.M; Russell, E.W. and Borick, C.P (2011). Introducing Public Administration Pearson Pub. United States. The aim of the module is to teach students the rudiments of public speaking, team work and presentations. Reading comprehension, Literary appreciation, Writing skills, Presentation skills, Working in groups for a presentation, Preparing for assessed presentation. Lectures will be given through power point presentations to explain the topics contained in the syllabus. A course that would provide basis for neophytes in accountancy profession. To provide students with basic understanding of accounting and financial reporting, introduce them to the concepts in IFRS and how to write up basic financial accounting records and books. 1. The Nature and Scope of Accounting: Origin and meaning of accounting. The Functions of Accountants. Accounting Functions and Its Relationship with the Information System of Organizations. Accounting Procedure and Systems. 2. Introduction to Conceptual framework for Financial Accounting. Accounting concepts and conventions including Double Entry Book-keeping Systems & Accruals. From GAAP to IFRS an introduction to IFRS. 3. Accounting process: From books of original entry to trial balance. 5. Introduction to correction of errors. 6. Introduction to control accounts & self-balancing ledgers. •	Lectures will be used to explain the topics in the syllabus. •	Present the origin of modern day accounting, and differentiate between financial accounting and book-keeping. •	Discuss meaning of financial accounting, its content and quality, and users of its information. •	Discuss basic accounting concepts and conventions. •	Distinguish between GAAP and IFRS and related terminologies. •	Write up books of original entry, principal books of accounts and extract a trial balance. •	Prepare bank reconciliation statement. •	Understand basic principles underlying control accounts and self-balancing ledgers. Ene, E. E. and Ejinwa U. J. (2014): Foundation in Accounting. 1st Edition. Abuja: Shollud Associates. Frank W. and Alan S. (2012): Business Accounting 1. 12th Edition. London: Pearson Education Limited. (Note: an older edition can be used). Thomas, A. and Ward, A. M. (2015): Introduction to Financial Accounting, 8th edition, London: McGraw Hill Education. (Note: an older edition can be used). Entrepreneurship II expands on the foundation to this subject which was laid during the module Entrepreneurship I. We examine in detail the entrepreneurial process and Steps in the process of assessing the viability of a new venture which will be illustrated and students will be expected to conduct such a study. The aim of this module is the creation of New Ventures, that is, the ways and means they come into being and the key factors associated with either their success or failure. Decision to become an entrepreneur, Developing successful business ideas, Moving from an Idea to an Entrepreneurial firm, Managing and growing an Entrepreneurial firm. The module employs lectures, videos, case discussions and analyses, student field work & presentations and general discussions to engage the student in the material. Student involvement in class activities play a significant role in the learning process. Understand the difference between an opportunity and an idea, how to recognize it and how to evaluate it. Appreciate ethical issues that are intertwined with entrepreneurial activities and develop a framework for managing ethical dilemmas. Evaluate the nature of creative new business concepts that can be turned into sustainable business ventures. This module examines underlying behavioral foundation theories of organizations and human personality. Other behavioral topics considered relevant to the understanding of human behavior in organizations such as motivation, the communication process, the Learning process and Learning curves and types, Leadership behavior and effectiveness, power relations and organizational change and development are also be covered. The module aims at providing students with a basic understanding of human behavior in Administrative Organizations for effective performance. •	The lecture method will be used to explain the topics outlined in the syllabus. •	Group assignments and class discussions will also be used to reinforce the learning process, improve students’ communication skills and encourage participation. •	See decision making as the core function of the Administrative Process. •	Appreciate the role of human personality and its understanding in the effective management of human behaviour in Administrative Organisations. •	Understand key topics in the study of human behaviour in organisations such as the Learning process, Decision making, Leadership behaviour and effectiveness, Human Motivation and Organisational change and Development. •	Herbert A. Simon; (1947) 4th Ed. Administrative Behaviour – A study of Decision Making Process In Administrative Organisations; Macmillan Publishers US. •	Duncan Jack. W; (1978) Organisational Behaviour; Houghton Mifflin Co. Boston US. This course examines Nature, Scope and objectives of Public Financial Management; statutory Laws Governing Public Financial Management. Budget and Budgeting in Nigeria. Planning in Public sector. Treasury Management. Financial management at state and Local Government Level. The aim of this module is to expose the learners to the rudiments of Public Financial Management. General background; Statutory laws; preparation of budget; treasury management; and planning in public sector. 1. Nature, scope and objectives of public Financial Management. · Lecture/ Teaching methods will be used to explain the topics to the learners. · To stimulate individual participation and develop communication skills, class discussion shall be employed. · Identify statutory Laws governing Public Financial Management in Nigeria. · Explain budget and Budgeting – Definition, Function of Budget, purpose of budgeting, budget cycle and problems of budgeting in Nigeria. · Explain Treasury Management at (Federal, State and Local Government level). · Discuss Financial Management at State and Local Government levels. i. Ojobo J.A (2011) Public Financial Management - Nigeria Perspective: Joyce Graphic Printers and Publishes Co; Kaduna. ii. Omopariola, O. (2003) Government Budgeting in Nigeria, Principles, Policies and Practices OAU press limited, Ife.